Definitely a Fall day today with the overcast skies and rain. Thanks to all the wind we had last week, most of the leaves are off the trees! Upper 30s tomorrow, mid 40s Saturday and back into upper 30s or low 40s to start next week. Maybe mid to upper 40s by mid week into the weekend. Kind of think we will see low 50s for the weekend. Generation continues to be pretty much 1-2 units for 2-3 hours in the morning and then again in the afternoon. Otherwise, perfectly good wading water. Projection for tomorrow is no generation until 5:00 p.m. then we will see a couple units for a few hours. Couple good days on the water last week. Tuesday, Gina took Terry, from Harrisonville, out for half a day. Terry had been with us before for the Orvis Fly Fishing clinic we had here in July. It was more instruction and definitely more catching for Terry this time. Despite the heavy wind, they worked scuds, and lots of streamers. They pulled the CQ streamerand the size 16 holographic green crackleback. Best scud was the tan with orange flashback. Stan had Guy, from Minnesota, out half a day on Wednesday. Guy was a beginner and now says he is an “ex-beginner”. He picked up casting very well and once he got past the hook set, he was landing fish. Best patterns were the P&P and little ruby midges. 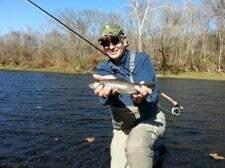 This entry was posted on Thursday, November 21st, 2013 at 6:05 pm	and is filed under Fishing Reports. You can follow any responses to this entry through the RSS 2.0 feed. You can leave a response, or trackback from your own site.